girl valley offers tender advice on taking care of yourself. I’m driving out of town to visit my boyfriend’s parents – I’ve been the one at the wheel for the last hour or so. The car is quiet. I can hear the other cars on the highway rushing past, but aside from that, the only noise around me is radio static and the sound of phlegm coming up my boyfriend’s throat. He’s in the passenger seat, reading a book, and normally this quiet would be comfortable for the both of us – but today, for me, it’s deafening. My head is full, flooding over the brim with worries, but all I’ve got to distract me is the speedometer, building quickly. Everything’s too fast. The highway is rushing alongside me, and I’m searching for something to hang onto; anything in my line of vision to ease me over. 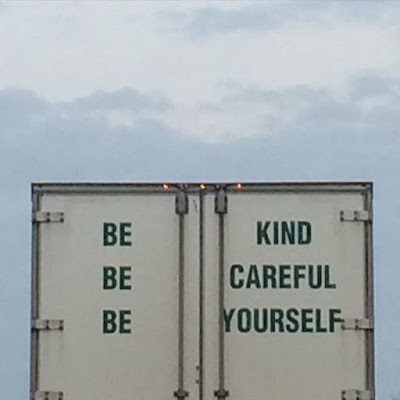 The album art for girl valley’s latest record shows the back of a moving truck, printed with the words: “BE KIND / BE CAREFUL / BE YOURSELF.” If I’d found myself behind this truck, I would have tailgated it, out of pure desperation. I felt so desperate that day – desperate to hear anything reassuring; anything kind. If I’d had heard girl valley over the radio instead of static, I’d have been just fine. girl valley is based in Chicago and their latest EP aptly reminded me to be kind, to be careful, and to be myself. Tender melodies hum gently just beneath the skin, pricking up goosebumps through certain guitar lines, in songs like "faceback." A quiet beat joins in on occasion, but aside from that, vocals bring everything home on the track. girl valley sings through murmured observations, like they’re sitting in the corner of a crowded room, dwelling on their innermost thoughts and feelings. In "tender warning," we hear this worrying hummed softly: “When your body grows / Who stays and who goes? / … / When your body settles / How do you tell the time?” These words are drawn out nervously, carefully, yet ever so beautifully. Listening to girl valley reminds you to take the world in as slowly – as gently – as you possibly can. The whole process can be nerve-wracking and worry-flooding, just like it was for me on that long, quiet drive, with the highway rushing past and nothing to hang onto. But if you take a moment to watch the world move, remembering to bring everything in carefully, with kindness, all the while remembering to be yourself – well, maybe the world won’t be so hard to take in. At least not with music like girl valley to bring us tender warnings when we need them most. Listen to girl valley on bandcamp.